Life’s always a beach in Frome especially on Frome Independent market days. Head into town on Sunday 2nd August and you’ll find all manner of seaside fun including the sudden appearance of an actual beach for the return of Frome-on-Sea! The hugely popular pop-up village green will once again be replaced with a pocket-hanky sized urban beach. 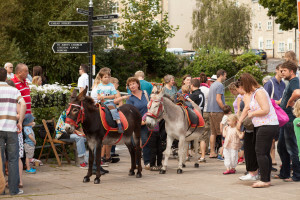 It was so popular with small and grown-up kids alike last year that The Frome Independent crumpled under the weight of expectation and happily gave into the pressure to bring back the beach… and the donkeys, and the deckchairs and of course the disco will be there too! As well as the beach there will be a raft of activities to keep kids entertained – a donkey ride or a turn on the vintage hook-a-duck, and just when you thought it was safe to go back in the water… it turns out that Doodlebug club will be helping kids make a whole school of scary sharks! The Frome Independent traders are responding to Frome-on-Sea with their usual creativity and aplomb – look out for a plethora of products inspired by or intended for the beach, from dog toys to deckchairs, prints to picnic blankets and sunglasses to sundresses. As ever, great food is a guarantee at the market – street food from around the world will transport you from Frome to the far-flung coasts of Italy, Spain, Thailand, north Africa and India, or find everything you need for that perfect British summer picnic, including Somerset produced charcuterie, homemade lemonade or a luxury scotch egg. Guaranteeing the weather is a different question – but if there wasn’t the risk of rain it wouldn’t be the British seaside now would it?